a cement lorry. essentially a flatbed truck loaded up with bags of blue circle cement. that was the object of my career path when i was about five or six. i had been given a matchbox model of just such a vehicle, and so all-enveloping was my admiration for this yellow painted truck, that i thought it a laudable aim in life to set my sights on driving just such a machine. thankfully, a six year-old has little idea of just what such employment would entail, nor indeed, the weight of even one bag of cement. suffice it to say, i have never driven anything larger than a long wheelbase transit van, nor am i likely to in the foreseeable future. in fact, at present, i do not own a motor vehicle of any description, and the far less industrial employment i find myself in is unlikely to alter that situation. the principle, however, not that i have yet described it, remains valid. perhaps just as unlikely an example (in my case) as wishing to become an astronaut, train driver or fireman, nonetheless, it is intriguing just what tiny fragments can inspire children of a certain age and have an unexpected influence on how they turn out once past those difficult teenage years. i later had notions of becoming an architect (what was i thinking? ), based purely on the fact that i could draw and my father worked in the building industry. such aspiration, however, came to nought on discovering i could draw a better straight line freehand than with a ruler. and generally, my technical drawing was a mess. judging by some of the buildings i see nowadays, there have been several others who fared no better. i know not quite what persuades or influences innocent youth to aspire towards the more sporting proclivities, in our specific case, that of cycling. even in my early twenties i had not made the connection between time-triallists heaving their way round the ayr bypass and men such as robert millar donning a polka dot jersey. the two remained unconnected for many a long year. neither of my parents showed any practical interest in any form of sport, other than watching football or wimbledon, and physical education at school was something to find a way out of rather than something to be embraced. i often wish i had thought otherwise. 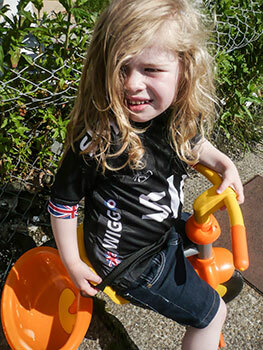 in the light of the above, it seems rather perspicacious of the chaps and chapesses in perren street to have released a range of children's team sky jerseys, virtually replicating those worn by their yet-to-be idols. or, in the case of the larger sizes, kids who may just find the prospect of equalling or surpassing sir bradley in the future an ideal target to aim at (see what i did there?). the four year-old in the photos accompanying this article is well aware that i ride my bike more often that i seem to walk. and she was overjoyed to receive a jersey that looked just like mine. the pride on her face when first putting it on would have melted concrete. 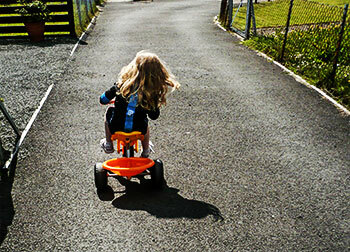 everytime she goes out on that orange and yellow trike (which is too small for her really), that jersey has to be worn. it has two rear pockets, plus a third zipped security pocket, there's the ubiquitous story label inside (which i had to read out loud) and it says wiggo on the side panels. rather neatly, it also features sky blue gloop around the jersey's hem to stop it riding up in use, a very useful notion considering how often the yellow and orange trike was lifted rather than cycled into position. and i think it was something of a godsend on a scooter. i have explained how sir brad was the first brit to win the yellow jersey at the tour de france, but i'm pretty sure she has little or no idea of which i speak. i also mentioned that mrs bower of imperial works has gathered together 100 women to ride this year's etape du tour, and my willing model for this feature has mentioned her ambition to do exactly the same "when i'm a big girl." it's likely that she'll need a bigger size of jersey by then. 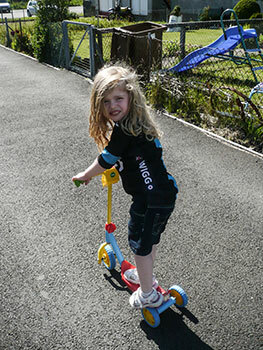 the little girl in the picture is wearing the kids' rapha team sky jersey sized for six to seven year olds, even though she's only four. it's a tad too large, but not ridiculously so. the jerseys are available in wiggo style (as shown) with a union jack on the right sleeve, and in regular team sky colours. both can be ordered in sizes xs to xl. size featured is a small. price is £50 for each. 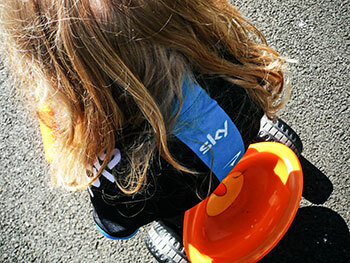 rapha also offer a kid's team sky supporters jersey at a more modest £35.